When German artist Ottmar Hörl created a gold-colored gnome giving the infamous Hitler salute earlier this year, he meant it as a satirical work, a mockery of Nazi ideology. When gallery owner Erwin Weigl put the gnome in the window of his Nuremberg store, he didn't even notice the Nazi connection  he just thought the gnome was waving. But when a local newspaper published a photo of the gnome, both Hörl and Weigl suddenly found themselves at the center of a criminal investigation that became a national talking point. Giving the Hitler salute or using Nazi symbols is a crime in Germany, punishable by up to three years in prison. After they spotted the photo in the paper in July, Nuremberg's state prosecutors started looking into whether displaying the saluting gnome constituted a criminal act. After a week-long probe, the authorities dropped their investigation, having decided that, as a work of art, Hörl's gnome is exempt from the law. But the fact that there was an investigation at all is proof of how seriously Germany takes its anti-Nazi laws. More than 60 years after the end of World War II, the horrors of fascism and the Holocaust remain etched in Germany's collective consciousness. In Nuremberg, the gnome's gesture touched a particularly raw nerve. The city played a key role in Hitler's rise to power, hosting the Nazi Party's annual rallies. In 1935 it gave its name to the anti-Semitic Nuremberg Laws, and later witnessed trials of war criminals. 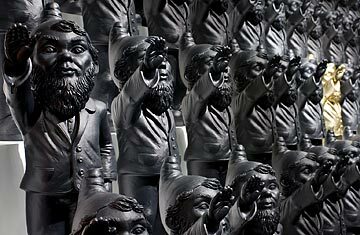 Now the gnome incident has some Germans questioning whether the country's strict anti-Nazi laws remain relevant in 2009. Germans have long understood that their country's constant struggle to distance itself from its past might mean it is doomed never to escape it. But what, some people are asking, does a gnome have to do with all that? Germany's post-World War II constitution, written in 1949, set out to ensure that a democratic system would be able to defend itself against forces hostile to democracy. The Grundgesetz guarantees basic rights like freedom of assembly and freedom of speech, but it also gives the state the power to ban organizations that threaten the democratic order. Clauses prohibiting the use of symbols which violate the constitution, including Nazi symbols, were added to the German penal code in 1960. In the past few decades, as Germany has seen a rise in right-wing extremism, these laws have been used as tools against neo-Nazis. In 1994, denying the Holocaust itself became a crime. But the question of how authorities should interpret Germany's anti-Nazi laws is increasingly complicated. In the past, courts have banned everything from model airplanes bearing swastikas to postcards showing Hitler's picture. Even anti-Nazi symbols have been considered criminal: two years ago, the owner of a mail-order business faced a fine for selling T shirts and buttons with crossed-out swastikas on them, until a federal court overturned the ruling. In January, controversy flared when the German state of Bavaria banned Zeitungszeugen, a weekly publication containing facsimiles of Nazi-era newspapers. The series gives a chronological look at events in Germany from January 1933, when Hitler became Chancellor, to the end of World War II in 1945. As well as reprints of original Nazi and communist papers, it includes commentary written by eminent historians. Bavaria accused the publisher, Briton Peter McGee, of breaching Germany's laws by disseminating Nazi propaganda; some Jewish groups warned that the reproductions of the Third Reich papers could be misused by neo-Nazi groups. But McGee fought back, saying the reprints were educational. After a noisy public debate and a court case that ended in McGee's favor, Bavarian authorities were forced to back down. The publication is now available  and selling well  at newsagents in most German cities. Then there's the case of Hitler's own writings. Since the end of World War II, Bavaria has blocked reprints of Hitler's autobiography, Mein Kampf. The southern state, which owns the copyright, says the ban is the only way to keep the book from being misused by the far right. But some German historians argue that scholarly editions of the book should be legally publishable. "Mein Kampf is a key work about the Nazis' rise to power and an important source of information about the Third Reich," says Horst Möller, a professor at Munich's Institute of Contemporary History.